The capital city of Norway. A very pleasant and culturally rich place. Often underrated in public perception, it is in reality these days almost a match for more widely acclaimed northern cities such as Copenhagen or Stockholm. For the dark tourist, Oslo offers even more than any of these, mostly sites related to WWII and the German occupation. More background info: Oslo can trace its history back to the 11th century, but it wasn't until much later that it became the capital of Norway and eventually superseded Trondheim and Bergen in significance. For a good part of its existence it was called Christiania (after King Christian IV, who rebuilt the town after a devastating fire in the 17th century). But it reverted back to its original name Oslo in 1925, twenty years after it had finally become the official capital city of modern Norway again, which had finally regained its independence from Sweden in 1905, ending a 500-year period of either Danish or Swedish rule. For many years and well into the second half of the 20th century, Oslo remained in the shadow of the more glamorous Scandinavian cities elsewhere, but things have changed a lot in more recent times. In classic architectural terms Oslo may not quite have the grandeur of some of its competitors on this front, but it offers cutting-edge modernity, has become a veritable cultural centre of the highest order, also boasting a vibrant night life, a wide-ranging restaurant scene with lots of multi-ethnic influences, a still developing scenic waterfront, and a generally tolerant and peaceful atmosphere overall (the Breivik episode excepted – see under Norway in general). Though by far Norway's largest city, Oslo is still comparatively small and compact (under 1 million inhabitants), and thus rather a laid-back kind of mini-metropolis. Enjoying all this as a foreign visitor, however, comes at a high price – literally! Oslo is one of the most expensive cities on the planet (see under access and costs below). It is definitely worth a visit though, in general as well as for the more dedicated dark tourist. For most it will be the first entry point into Norway anyway, so it makes sense to spend a few days in this surprisingly charming capital. The Nobel Peace Centre ("Nobel Fredssenter" in Norwegian) is one of these. As you may know, the Nobel Prizes of all other categories are awarded and presented in Stockholm, but as the one exception to this rule, the Nobel Peace Prize is awarded by a Norwegian committee and presented annually in Oslo. The Nobel Peace Centre is dedicated not only to all the Nobel Peace Prize laureates since it was first awarded in 1901, but also to the subject of peace at large in the modern world. Since that invariably involves some kind of threat to or absence of peace, it includes a lot of "dark" topics, especially wars and other human tragedies. Indeed, the special exhibitions in Oslo's Nobel Peace Centre often cover politically charged topics revolving around contemporary "hot spots" and conflict zones in the world. The permanent main section of the exhibition at the centre, however, is more a celebration of past Nobel Peace Prize winners and their achievements. It includes a somewhat bizarre kind of hall of fame upstairs in which each laureate is given a small panel with a photograph on a stick, all set in rather gloomy subdued lighting, like a modern art installation. More museum-like are sections that provide background information about some of the more recent laureates and their work. When I was there in the summer of 2012, the downstairs exhibition sections had temporary presentations of war photography and video diaries produced by young women in Afghanistan. But the topics of these temporary addenda change frequently. All labelling and texts are in Norwegian and English. The other particular place that includes aspects of interest to dark tourists is the Fram Museum. The Fram was possibly the most famous ship of the age of pioneering polar explorers to have come out of Norway. It was first built for Fridtjof Nansen to serve on his Arctic adventures, including the North-West Passage and attempts to reach the North Pole itself. The ship was designed to keep afloat in dense pack ice without being crushed (like e.g. Shackleton's ship in the Antarctic – see South Georgia). How well designed the vessel indeed was is proven by the very fact that it is still intact and here on display! The other most famous explorer to use the Fram was Roald Amundsen, notably on his Antarctic expedition which he embarked upon when he learned that he'd lost the race to the North Pole (to Robert Peary from the USA – although that achievement has since become disputed). Instead Amundsen turned south and now raced against Robert F. Scott from Great Britain on his attempt to be the first to reach the South Pole. As we all know, Amundsen did end up beating Scott to it (on 14 December 1911) – see under Antarctica. But the fact that Scott and his companions perished on their way back from the Pole, after being devastated by the discovery that they'd lost the race, is still cause for some misgivings about Amundsen and the fact that he had not played "fair", because he had started his plans to go to the South Pole "behind Scott's back" … That was only the case at first, though. He did inform Scott by telegram when he was en route, and Scott claimed (although that's not entirely believable) that he wasn't perturbed by the revelation or pushed into any haste by it. The main difference between the two rivals' approaches was that Scott was partly ill-prepared, relied on untested new technology and unsuitable hauling animals (ponies), and was also plain unlucky, while Amundsen called upon tried-and-tested Arctic dog-sledding, sacrificing some of the very same dogs that got him to the Pole as "provisions" on the return journey – whereas Scott upheld his noble mercy towards his ill-suited animals and instead rather sacrificed himself … well, and his men (so is that more or less noble?). Still, it's one of the greatest tragic adventure stories of the early 20th century. And that's why the Fram Museum is listed here as a dark tourism attraction of sorts. The main exhibit is the Fram itself, which visitors can explore freely both on deck as well as below deck – to see the specially strengthened hull, the engine, the crew's quarters and mess complete with gramophone and a piano, as well as the private cabins and personal belongings of Amundsen and others who sailed on the Fram. The ship is housed in a hangar-like superstructure, and its inner walls around the Fram are lined with additional exhibits such as yet more personal belongings of the polar explorers, dioramas of the Fram in pack ice, stuffed polar animals (including a rather too "elongated" polar bear on its hind legs) and so forth, further enhanced with additional interactive computer screens as well as films and slide projections onto the inside of the hall's roof (including mock Northern Lights – very atmospheric!). One especially notable exhibit is a facsimile of the original telegram that Amundsen sent to inform Scott of his plans to join the "race" to the South Pole. It simply read: "Beg leave to inform you Fram proceeding Antarctic". When I was there in August 2012 there was even a special exhibition about Scott and his failed attempt to win that race and how it ended in deadly tragedy. It was compiled by Cambridge University's Scott Polar Research Institute. No matter how well known the story may be, this exhibition was intensely touching all the same. Whether it is there to stay as part of the Fram Museum or whether it was intended only as a temporary addition was not entirely clear, however. My fear is that it may only have been temporary, which would be a shame, really. Amundsen's own tragic end is also covered by the regular permanent exhibition of the Fram Museum (see under Svalbard for more on this). But overall, the focus is much more celebratory of his great achievements and those of his fellow Norwegian explorers. This being in Oslo, I suppose it's only fair … The museum also features a large souvenir and book shop that is well worth browsing in. All labelling and explanatory texts in the museum are at least bilingual (Norwegian and English), and many of the interactive screens also feature several other language options (French, German, Spanish, Italian, Russian, Japanese, even Korean!). The Fram Museum is part of a larger complex on the Bygdøy peninsula south-west of central Oslo, and also features, amongst other things, excavated Viking ships from the 9th century, a general maritime museum, and a folk museum. Another popular component is the Kon-Tiki Museum, which is centred around the original balsa craft used by Norwegian explorer Thor Heyerdahl in his attempts to prove an intrinsic connection between the native peoples of the Andes (in particular in Peru and Bolivia) and Polynesia (e.g. Easter Island), namely that the former colonized the latter. He did prove that it was possible to cross the Pacific in such boats and to make it to those scattered islands. However, his scientific conclusions about a migration in that direction have long since been proven wrong (see under Easter Island). Norwegians don't like hearing this, but the consensus really is quite against Heyerdahl's theories these days – although that shouldn't detract from admiring his bold bravery in making these ocean crossings in such historic types of vessels (he also undertook similar expeditions in rebuilt ancient crafts from other cultures too). Back firmly on dry land: parts of the famous Vigeland Park's exposition of sculptures also involves dark-ish aspects. It's a vast collection of works by Norway's most famous sculptor Gustav Vigeland. Around 200 of his pieces can be seen for free here. The high point (also literally) is the famous column at the far end, on a mound in the centre of the larger Frogner Park. The column is sculpted in such a way that it looks like hundreds of naked human bodies writhing and struggling to get to the top. Apart from this most photographed item, there are dozens of other highly intriguing and entertaining works, including some of a vaguely sexual nature, a whole series involving rather cruel treatment of children, and also some grim bronze reliefs depicting death, or approaching death … as well as various stages of decay. 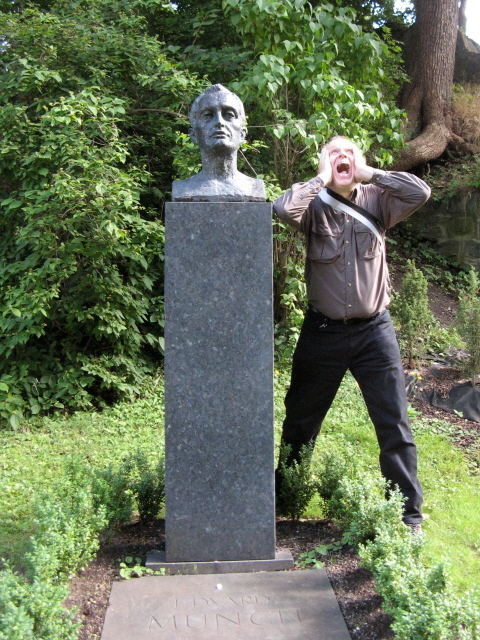 Speaking of Munch's famous "The Scream" – the real thing is on display in Oslo's dedicated Munch Museum (10 a.m. or 12 noon to 6 p.m., 95 NOK) further east in the Grünerløkka area (Tøyengata 53). There are in fact several original versions of this famously dark piece of art, including two paintings, as well as pastels. One of each can be seen at the Munch Museum, the other painting is at the National Gallery. One of the pastels is in private ownership and was sold for the ludicrously high price of ca. 120 million USD at an auction in May 2012. Clearly not prepared to pay such money, art thieves stole the painted versions from both the National Gallery and the Munch Museum, in 1994 and 2004, respectively; but the works were recovered soon after. Still, it led to some ridicule about the (then) lax security at these institutions. Not at all a laughing matter, on the other hand, was the Oslo bombing and mass shooting atrocity at Utøya island committed by right-wing terrorist Anders Breivik in July 2011 – see under Norway for more on this. When I was in the city just over a year later, while the trial against Breivik was approaching its finale, I came across what looked like a makeshift memorial to the tragedy, involving two heart shapes, one in cobbles, one a kind of balloon on a stick, as well as flowers, wreathes, and a framed collection of passport photo images of the victims. Though probably only intended as a temporary tribute it already appeared to have gained some longer lease of life, though I cannot be absolutely sure if it's still there. I spotted it by the cathedral (Domkirke) near the corner of Kirkegata and Karl Johans gate. Location: in the south of Norway, at the head of the fjord of the same name, some 200 miles (320 km) east of Bergen and ca. 260 miles (420 km) west of Stockholm. Access and costs: easy to get to by plane, but overland only from/via Sweden; a very expensive city indeed. Details: Oslo's international airport is well connected to other European cities and beyond, as well as to the Norwegian domestic flight network. Getting there overland, on the other hand, is only possible from neighbouring Sweden – on excellent roads or by rail. Getting to Oslo by boat is a more limited option, but there is still a regular ferry connection to Denmark. Other than that it's only cruise ships that dock at Oslo's harbour (too many of them for my liking!). Getting around in Oslo is fairly easy. Most of the city centre is quite walkable, only trips out to e.g. Bygdøy or Vigeland Park require use of public transport. In Oslo this consists of very useful tram lines, and also buses and even ferries. Single tickets purchased on board cost more than pre-purchased ones. Particularly useful, if you intend to use public transport a lot, are the 24-hour tickets or the tourist Oslo Pass, which also gives you free admission to many museums. But calculate in advance whether the Oslo Pass really pays off for you. The Nobel Peace Centre is easily walkable from anywhere in central Oslo. Its opening times are: Tuesday to Sunday 10 a.m. to 6 p.m., admission is 80 NOK (which I found rather a lot for what was offered in the main exhibition). By the entrance is also a vast bookshop. 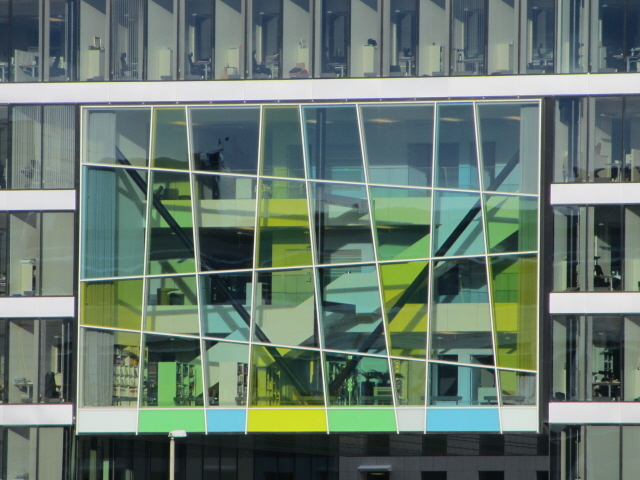 The centre is located at the head of the Aker Brygge waterfront development and on the edge of the Rådhusplassen. The Fram Museum is on Bygdøy, which is connected to central Oslo by bus (line 30) or – much more scenically: by a pedestrian ferry service (No. 91) that departs frequently from a jetty right opposite the Rådhus (City Hall) at the head of Aker Brygge not far from the Nobel Peace Centre (but it only runs April to October). The ferry first stops at Dronningen by the Royal Norwegian Yacht Club before proceeding to the Bygdøy jetty right by the Fram Museum. The ferry charges a pretty hefty fare if you pay on board – but is covered by the 24h Oslo transport tickets, as well as by tickets pre-purchased on land, which is the much cheaper option. The museum's opening times are: at least 10 a.m. to 4 p.m., daily, year-round – extended times in season, up to 9-18h in June to August. Admission: 80 NOK (seniors 60, students 30 NOK). Unlike in many other museums in Norway, the high price feels fully justified in this case! What is known as Vigelandsparken is actually part of the larger Frogner Park, which is located to the west of the city centre, but is easily reached by tram (line 12). The park is open at all times, year-round. Accommodation in Oslo can be as expensive as you may fear – but, the good news is: it needn't cost you an arm and a leg. If you shop around well in advance and look out for special offers, staying in Oslo can actually work out cheaper than in the rest of the country – probably because there is such a wide range available in the city. Food & drink, too, are mostly very expensive – as everywhere in Norway. But again there's a silver lining, in this case in the form of Oslo's many ethnic restaurants, which generally cost significantly less than upmarket European restaurants. So why not go for a curry or try some Somalian or Ethiopian cuisine? Time required: To see all the dark sites especially pointed out here you'd need about two days in order to do them justice and cover the ground between them. But Oslo in general deserves a little more time than that. About four days to a whole week can easily be used up here without getting bored. The Nobel Peace Centre takes about one hour. The Fram Museum can require quite a bit more time if you're really into its subject matter … I spent about two hours there, plus time for getting there and back. If you also want to see the other museums on Bygdøy, it can turn into a whole-day outing. Vigeland Park takes as long as you want to spend viewing weird sculptures, so anything between a 20 minute cursory glance and a couple of hours of in-depth study. Combinations with other dark destinations: Oslo is the main gateway to Norway, the most likely first arrival point for any visitor to the country. Most of Norway's dark sites outside this city itself, however, are located quite far away from it. But some can be reached quite quickly by direct internal flights from Oslo, such as Kirkenes, and e.g. Narvik can be reached with just one stopover in Bodø. Oslo is also one of the two departure points (the other is Tromsø) for flights to the Arctic archipelago of Svalbard, which is nominally Norwegian territory too. Closer to Oslo itself and reachable by either bus or car are Vemork with its Industrial Workers Museum (site of one of history's most significant sabotage operations) and the nearby Gaustabanen. And Bergen on the west coast of Norway is within easy reach by train (on a very scenic route at that). See also under Norway in general. 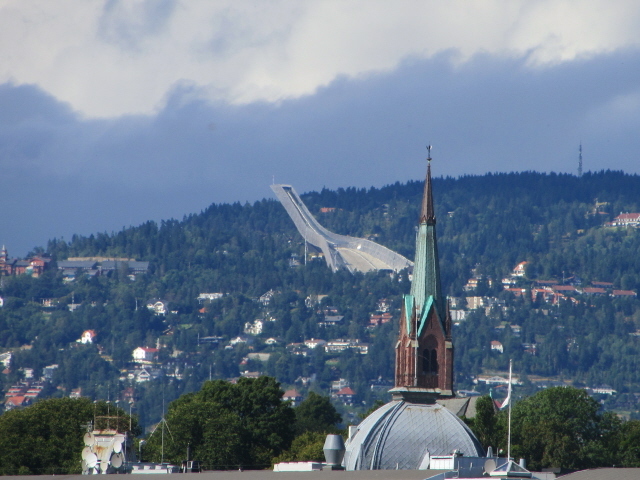 Combinations with non-dark destinations: Oslo has more (non-dark) attractions than can possibly be listed here. Only a very cursory personal impression can be given here. 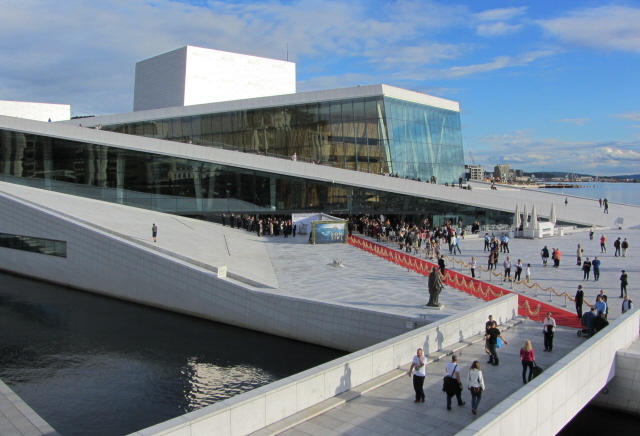 The new crown jewel in Oslo's tourist attractions is the daringly modern Opera House on the eastern harbour front. Its sloped white-marble-clad hulk is supposed to resemble pack ice, and though it may not look all that convincing from a distance it is great fun walking on it. Yes, this is an opera house where you really can be on top of it all! The actual theatre parts are hidden inside, while for most casual visitors the main attraction is climbing the gently sloping facade. Some even slide down. (Is that disrespectful to the building's cultural highbrow main purpose? I don't know.) The opera, which only opened in 2008, is the centrepiece of a larger project to turn around the former docks and bring them into the 21st century – as has happened in so many places round the world. 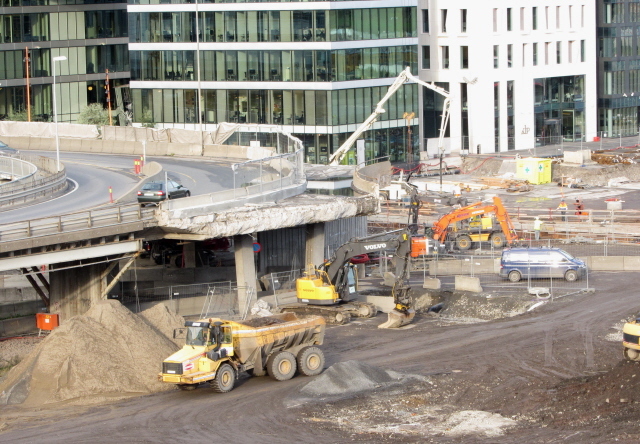 Here the modern development is still ongoing … or at least still was ongoing when I was there in August 2012. But it already showcased some rather convincing examples of architectural modernity. The whole development, known as "The Barcode Project", has the potential to become quite a striking ensemble when it's all finished. And it will offset the rather boxy and plain red-brick style of Oslo's other main architectural landmark, the City Hall (Rådhus). More conventional, older architecture can be found along Oslo's main central axis, Karl Johans gate, which runs all the way from the Royal Palace, past the National Theatre and the Storting (parliament), then the cathedral, and finally ends at the central train station. Half of it is a pedestrianized shopping street … although for actual shopping it can hardly be recommended. For one thing Norwegian price levels prohibit that, and also it's boring: dominated, as almost everywhere these days, by the same standardized global brand names. Yawn! Another detraction from that are the frequently visiting cruise ships that can blot out any view and provide an eyesore that couldn't contrast more nastily with the old fortress buildings and Oslo's skyline in general. On a smaller scale, though, seeing Oslo from out in the harbour on boat trips is certainly a particular attraction of this watery capital of the ancient seafaring nation that is Norway. The ferry to Bygdøy is only one of many boat ride options. This one also takes you past the Royal Yacht. Others head out further to the various islands dotted around Oslo fjord. On land, the Vigeland Park already mentioned above is one of the most popular Oslo locations that tourists flock to away from the immediate city centre. And it is indeed very much worth it – even if you're not normally such a fan of art in general or sculpture in particular. These works are quite accessible to interpretation by non-experts and many are highly entertaining. Really not to be missed. And then there are Oslo's countless other art galleries and museums – there's something for everyone. But it's beyond our scope to further dwell on this. As a final word: those after a taste of Oslo's multi-ethnic character should explore the Grønland district north of the central station. Here, you can find the colours, smells and feel of various non-European nationalities. Incidentally, when I was in Oslo in late August 2012, there was a multicultural festival on (called Mela festival) which mainly took place on Rådhusplassen, the square between the City Hall, the fortress and the Aker Brygge waterfront. It featured stalls with exotic food, ethnic music and performances and information stands. As if to make for an ironic twist of fate, it was going on at the same time as the Anders Breivik court case came to its conclusion. I found that confident display of modern multiculturalism an admirable antidote to the depressingly backward and inhumane causes of right-wing nutcases such as Breivik. For more combinations outside Oslo see under Norway in general.